Alaska Regulators Again Taking Up Onsite Marijuana Consumption . The state Marijuana Control Board will today resume its debate over whether to permit businesses to allow onsite consumption of marijuana. The board had decided in February to kill the idea, citing uncertainty over the Trump administration, but now it has reopened the process, inviting members to submit proposed new regulations. One proposal would impose a two-year moratorium on onsite consumption, while two others would allow for it, but one of those would not allow smoking or vaping. 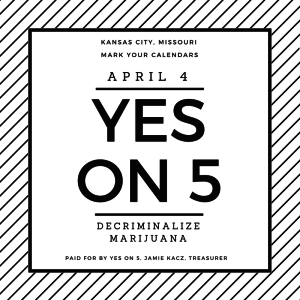 Kansas City Votes to Decriminalize . Kansas City, Missouri, residents voted overwhelmingly Tuesday to decriminalize the possession of small amounts of marijuana. Unofficial vote counts had the measure winning with 71% of the vote. The measure will amend local laws regarding the possession of up to 35 grams of marijuana for adults age 21 and older from a criminal misdemeanor, previously punishable by up to six months in jail and a $1,000 fine, to a civil offense punishable by a $25 fine -- with no arrest made or criminal record imposed. Maryland Bill to Allow More Licenses, Increase Diversity Passes House . The House of Delegates voted Tuesday to approve House Bill 1443 , which would allow five more licenses to grow and process medical marijuana. The bill is aimed at increasing minority participation in the developing industry, which the state's medical marijuana law explicitly calls for. "Passing this bill will show the country that this is not an issue that we're going lock African Americans and other minorities from participating in this business venture," bill cosponsor Del. Cheryl Glenn said before the House vote. "Less than 1% of the licenses held in the entire country are held by African Americans and other minorities. I'm very proud at the state of Maryland that we are passing this legislation. Nothing is perfect, but this is really moving us along the path of having a fair system in the state of Maryland." West Virginia House Votes for Medical Marijuana . The House voted Tuesday to approve Senate Bill 386 , which would establish a medical marijuana system in the state. The Senate passed the measure last week, but since it was amended in the House, reconciliation or a conference committee agreement must occur before it can head to the governor's desk. Maryland General Assembly Adopts Bills to Combat Opioid Epidemic . The House of Delegates voted Tuesday to approve a package of bills aimed at increasing access to drug treatment and crisis services, education, and public awareness around opioids. The bills are House Bill 869 , which will require the state to compile a list of accredited recovery residences, House Bill 1082 , which will require public schools to provide drug education and train personnel to respond to an opioid overdose; and House Bill 1329 , which establishes a Health Crisis Hotline and network of crisis treatment centers. Because the bills were adopted with minor differences in the House and Senate, the House must vote one more time to approve the measures before they head to the governor's desk. Florida Welfare Drug Test Bill Moving . A bill to require welfare applicants with drug convictions to submit to mandatory drug testing has been approved by two subcommittees and now sits before the House Health and Human Services Committee. The measure, House Bill 1147 , passed out of the Health Care Appropriations Subcommittee Tuesday. Under the bill, applicants who test positive for drugs would lose benefits for a year, but could reapply after six months if they've completed a drug treatment program at their own expense. Indiana Bill Criminalizing Use of Synthetic Urine Passes Legislature . The state Senate on Tuesday unanimously approved House Bill 1104 , which would make it a misdemeanor to use synthetic or another person's urine for a drug test. The bill now heads to the governor's desk.